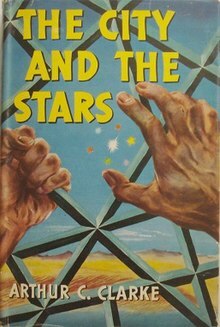 The City and the Stars is a science fiction novel by British writer Arthur C. Clarke, published in 1956. This novel is a complete rewrite of his earlier Against the Fall of Night, which was Clarke's first novel, and was published in Startling Stories magazine in 1948, after John W. Campbell, Jr., editor of Astounding Science-Fiction, had rejected it, according to Clarke. Several years later, Clarke revised his novel extensively and renamed it The City and the Stars. The new version was intended to showcase what he had learned about writing, and about information processing. The major differences are in individual scenes and in the details of his contrasting civilizations of Diaspar and Lys. Against the Fall of Night remained popular enough to stay in print after The City and the Stars had been published. In introductions to it Clarke has told the anecdote of a psychiatrist and patient who admitted that they had discussed it one day in therapy, without realizing at the time that one had read one novel and one the other. In Diaspar, the entire city is run by the Central Computer. Not only is the city repaired by machines, but the people themselves are created by the machines as well. The computer creates bodies for the people of Diaspar to live in and stores their minds in its memory at the end of their lives. At any time, only a small number of these people are actually living in Diaspar; the rest are retained in the computer's memory banks. All the currently existent people of Diaspar have had past "lives" within Diaspar except one person—Alvin, the main character of this story. He is one of only a very small number of "Uniques", different from everybody else in Diaspar, not only because he does not have any past lives to remember, but because instead of fearing the outside, he feels compelled to leave. Alvin has just come to the age where he is considered grown up, and is putting all his energies into trying to find a way out. Eventually, a character called Khedron the Jester helps Alvin use the central computer to find a way out of the city of Diaspar. This involves the discovery that in the remote past, Diaspar was linked to other cities by an underground transport system. This system still exists although its terminal was covered over and sealed with only a secret entrance left. Once out of Diaspar, Alvin finds that one other human habitation remains on Earth. In contrast to technological Diaspar, Lys is a vast green oasis shielded by mountains from the worldwide desert. Its people are not stored and recreated technologically, but naturally conceive, are born, age, and die. They have rejected the hyper-advanced technology of Diaspar in favor of an almost agrarian existence, with machines used only for labor-saving purposes. The people of Lys have instead worked to perfect the arts of the mind; they are telepaths, capable of communicating with each other over great distances and without words. Vanamonde is the second, successful experiment of the ancient empire: a being of pure intellect, immensely old, immensely powerful, able to move instantly to any point in space—but entirely childlike and unsophisticated. Vanamonde's ultimate destiny, Hilvar realizes, is to battle the Mad Mind, when it escapes its prison at the end of Time. After this, most of the Galactic Empire had left our galaxy, leaving only a scattered few. This departure from the galaxy, leaving it to Vanamonde, was because contact had been made with a "very strange and very great" intelligent, extraterrestrial species, which called them urgently to the other side of the universe. Alvin's discoveries reunite Diaspar with Lys. He then sends the ship, under the command of the robot, to search for the long-lost people of the Empire. He does not wish to search himself—even if there are human remnants in the Galaxy, they are probably decadent—and he has work to do on Earth. Even the environment, he hopes, can be revived. ^ Prescott, Orville (January 27, 1956). "Books of The Times". The New York Times: 21. His newest novel, The City and the Stars, is published today.